Happens Here on November 10, 2017 in Nashville, Tennessee. An intimate concert by seven-time GRAMMY award winning Lady Antebellum at the Country Music Hall of Fame and Museum exclusively for Hilton Honors members as part of Hilton's music program, Music Happens Here. 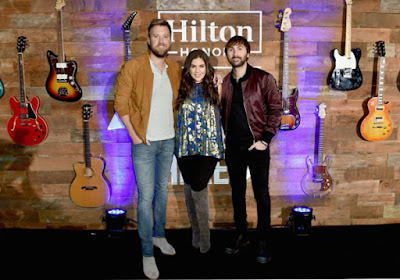 Hilton's music program, Music Happens Here, gives Hilton Honors members access to top concerts, private meet-and-greets with chart-topping artists, one-on-one artist experiences, and exclusive concerts at Hilton hotels/resorts and in legendary music landmarks. This year, Hilton, in partnership with Live Nation and Spotify, launched an original music and video travel series, Music Happens Here, which looks into some of the most iconic places around the world where music has been created, performed, and celebrated. The episodes released thus far examine the storied music histories of Los Angeles, London, and New Orleans.